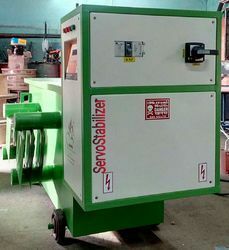 Servo Stabilizers, Voltage Stabilizers, Two Phase To Three Phase Motor Starters, Two Phase To Three Phase Converter, Ac Drives, Rectifier Transformers, Automatic Power Factor Controller Panel, Energy Saver Equipment, Control Panels, Quality UPS, Industrial Transformers, Surge Protectors, Constant Voltage Transformers, Industrial UPS, AVRs, Energy Savers, Sakthi Electrical Control, Coimbatore, india. 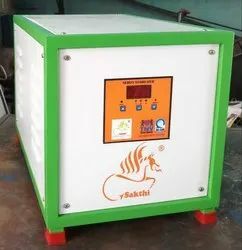 sakthi electrical control manufacture by 100kva servo stabilizer ,It is a device which corrects the heavy fluctuating raw incoming power supply and provides constant stabilized voltage to equipments to the accuracy of ± 0.5 to 1.0 %. Raw Power is fluctuating in nature and, may therefore cause severe damage to the expensive hi-tech electrical / electronic equipments, if not controlled & stabilized. Besides the risk of damage, it can consume more power leading to higher electricity bills. Therefore it is necessary to control & stabilize the raw power. 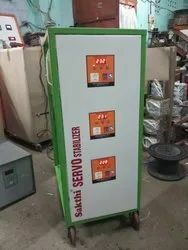 Sakthi Servo Stabilizers are well-known for the qualitative features of high durability and effective performance. Available under the brand name of "SAKTHI", these precisely engineered products are high performing and easy to install. These servo voltage stabilizer has been designed according to the International Standards. Our servo stabilizers are very effective for power and voltage control under conditions of extreme voltage fluctuations. We are manufacturer and supplier of all kinds of servo stabilizers. Our range includes oil cooled servo stabilizers. Our products include air-cooled stabilizer, oil cooled servo stabilizers, single phase servo stabilizers, three phase servo stabilizers. Further to maintain the consistency in the performance of the machines, these are also continually upgraded. 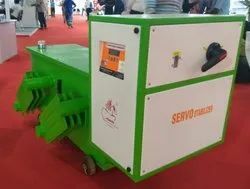 We are offering oil cooled servo stabilizers. We are looking for queries for Power Engineering Equipment from Tamil Nadu, Kerala, Karnataka & Andhra Pradesh. We supply Voltage Controllers that is available in a capacity of 400 volts (three phase) and 230 volts (single phase). It is specifically used to protect the electrical and electronic equipment that are effected by the voltage fluctuation. Soured from leading manufacturers, our range finds usage in General Laboratory Equipment, C. N. C. Machines, Escalators and Elevators and Air-Conditioning Plants. Manufacturer and supplier of Air Cooled Servo Stabilizer. Our range of Air Cooled Servo Stabilizer is available with following features. We are ranked amongst the foremost firms, engaged in offering a qualitative range of Oil Cooled Servo Stabilizer 100KVA, 150KVA. These products are manufactured by our experts using high grade material and latest technology in compliance with international standards. We are a leading manufacturer and supplier of Servo Stabilizers from Coimbatore, Karnataka, Andra pradesh, kerala and South India. Single Phase Servo Stabiliser Air Cooled offered comprise highly functional Voltage Stabilisers that are designed using latest technology support so as to provide for optimum functional usage. Single Stabilisers find extensive usage in controlling voltage fluctuations using solid state electronic circuitry. Being single phase stabilisers, these function as automatic line voltage corrector that use synchronous motor that provides for optimum functional usage. We manufacture a range of Three Phase Servo Voltage Stabilizers that are primarily used to protect the various electronic equipment such as fridge and others, that are affected by the fluctuation in the input of the mains supply. At times the equipment do not function properly when they are not used at the specified voltage. Servo voltage stabilizers (single and three phases) with sensitive electronic and electrical equipment hold a lot of importance as they increase the operational life of expensive appliances, CNC machines, electrical equipment, motors lab equipment, medical equipment. 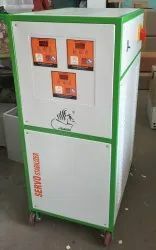 The servo controlled voltage stabilizer connects the AC voltage which is not stabilized and dips at one point of time and at other point of time rises to very high value. We manufacture and supply Single Phase Voltage Stabilizer which are highly functional and work effectively. Our servo voltage stabilizers match with international standards. Their controlled flow of voltage protects domestic and commercial electrical & electronic system from power fluctuations. We at Sakthi Electrical Control take the pleasure to introduce ourselves as the pioneers in the field of power conditioning serving the industry by manufacturing, wholesaling, distributing, service providing, trading and retailing and exporting products like Servo Stabilizer, Voltage stabilizer, Oil Cooled Servo Stabilizer, Air Cooled Servo Stabilizer, Isolation Transformers, Energy Savers, AC Inverter Drives, Phase Converter, Two Phase to Three Phase Converter and many more. 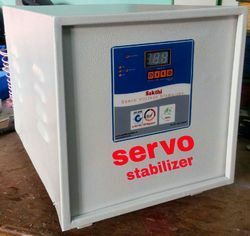 Servo Stabilizer, Voltage Stabilizer, Variac, Servo Motor, Avr, Cvt, Ups, Variac, Voltage Transformers, Transformer, Variac, Manual Voltage Stabilizer, Isolation Transformer, Single Phase Motorized, Portable Closed Variac, Portable Open Variac, Air Cooled Servo Stabilizer, Oil Cooled Servo Stabilizer, Single Phase Servo Stabilizer, Servo, Manual, Stabilizers, Regulators, Servo Stabilizers, Rectifiers, Ht Avr, Voltage Regulators, Voltage Controllers, Servo Controlled Voltage Stabilizers, Automatic Voltage Controllers, Automatic Servo Voltage Stabilizers, Automatic Voltage Regulators, Earthing Transformers, Distribution Transformers, Power Transformers, Low Voltage Transformers, Medium Voltage Transformers, High Voltage Transformers, Neutral Transformers, Ultra Isolation Transformers, Variable Transformers, Furnace Transformers, Electric Traction Transformers, Off Load Tap Changer Transformers, Dc Rectifiers, Plating Rectifiers, Electric Traction Rectifiers, Anodizing Rectifiers, Three Phase Servo Stabilizer, Constant Voltage Transformers, Air Cooled Transformers, Three Phase Servo Voltage Stabilizer, Digital Display Servo Stabilizers, Motorized Control Auto Transformer, Ac Stabilizers, Refrigerator Stabilizers, Single Phase Variac, Power Stabilizers, Digital Servo Voltage Stabilizers, Three Phase Stabilizers, Single Phase Stabilizers, Electronic Voltage Stabilizers, Main Line Voltage Stabilizers, Toroidal Transformers, Ac/dc Chokes, Inductors, Automatic Stabilizers, Electrical Transformers, Industrial Transformers, Line Interactive Ups, Ac Voltage Stabilizer, Single Phase Voltage Stabilizer, Three Phase Voltage Stabilizer, Centralized Voltage Stabilizers, Motorised Variac, Three Phase Variac, Coils Variac, Dimmer, Variable Voltage Auto Transformers, Servo Controlled Voltage Stabilizer, Automatic Voltage Stabilizer, Manual Stabilizer, Variac Transformer, Current Transformer, Auto Transformer, Autovolt Variacs, Variable Auto-transformers, Servo Transformers, Ce Marked Transformer, Three Phase Transformers, Control Panel Transformers, Rectifier Transformer, Manual Transformers, Cvt Transformers, Three Phase Transformers Electrical Transformer. Andhra Pradesh, Arunachal Pradesh, Guwahati, Assam, Sikkim, Nagaland, Mizoram, Gandhinagar, Kanpur, Varanasi, Patna, Agartala, Karnataka, Bhubaneswar, Assam, Hyderabad, Bhopal, Indore, Dehradun, Rajasthan, Lucknow, Punjab, Kerala, Moradabad, Mumbai, New Delhi, Ludhiana, Jaipur, Chandigarh, Pune, Rudrapur, Tamil Nadu, Goa, Tripura, Bangalore, Chennai, Orissa, Srinagar, Meerut, Kolkata, Guwahati, Chhattisgarh, Kohima, Ranchi, Pondicherry, Gujrat, Arunachal Pradesh, Bihar, Madhya Pradesh, Maharashtra, Nagpur, Raipur, Thiruvananthapuram, Daman, Sri Ganganagar, Jammu & Kashmir, Uttar Pradesh, Silvassa. Afghanistan,Bahrain, Bangladesh, Bhutan, Canada, Boston, Egypt, Cairo, lagos, Ikeja, Dubai, Uae, Sharjah, Abu Dhabi, Sudan, Dhaka, Bangladesh, Nepal, Bhutan, Sri Lanka, Ghana, Israel, Kenya, Lebanon, Malaysia, Mozambique, Oman, Namibia, Nepal, Nigeria, Qatar, Russia, Singapore, Saudi Arabia, Dammam, Kuala Lumpur, Indonesia, Vietnam, South Africa, Zimbabwe, Thailand, United Arab Emirates, Uganda, United Kingdom, UK, Tanzania, United States, Chile, Peru, Yemen, Zambia.